Prior to 1857, Margate had been administered by Dover- one of the Head Cinque Port Towns. Mentioned in Royal Charter in 1155, the Cinque Port Towns enjoyed considerable privileges and exemption from taxation in return for supplying ships and men to protect the Channel in time of war. Over the years, many of the Cinque Port Towns went into decline and had difficulty fulfilling their obligations and called upon smaller ports to share the burden, and to share in the Cinque Port privileges. These additional ports became Members (also called Limbs) of their local Head Port. The arrangements made with the larger towns were confirmed by Royal Charter; these towns were known as corporate Members of their local Head Port. Margate, and the Parish of St John's, were too small and insignificant to become Corporate members and so joined Dover in a less formal way, without a Royal Charter, and became non-corporate member. This still conferred many advantages for a small place such as Margate and St John’s – apart from a share in the local herring fishery, it enjoyed freedom from County tolls and taxes, and it enjoyed constitutional and judicial liberties that would normally only have been enjoyed by a wealthy corporation. In 1424, wishing to strengthen its position and clarify the bargains it had made with Dover, Margate asked for a charter granting in express terms the liberties of Dover, which it had enjoyed as a Member ‘de temps que memore ne court’. In 1424, Margate and the Parish of St. John's together with a group of other Thanet parishes, were recognised in a Charter as 'members and advocants of the port of dover'. The disadvantage of this corporate membership was, of course, that it placed Margate in a subservient position to Dover. The Mayor of Dover would appoint a Deputy Mayor of Margate. Many attempts were made by Margate to throw off the yoke of Dover, the first was made in 1784 but failed. Various Acts of Parliament over the next few decades aimed at Reform encouraged Margate citizens to continue to agitate for its own Charter of Incorporation. In 1787, a so-called Improvement Committee was set up which would run Margate under the leadership of the Deputy appointed by Dover. The Cobb family (known as ‘King Cobb’) had been for decades a leading power in Margate and continued to be on this Committee – which was self-electing. At one point, of the 12 members, 6 were from the Cobb family. One of the first acts of this Commission in 1787, was to agree to the erection of a building on Market Place, formerly Pier Green formerly known as Bowling Green, an open area in the centre of Margate, where it could conduct its affairs. The Margate Pier Company owned a property on the site which, Mr Cobb, Chairman of the Commission and also a share-holder of the Pier Company, suggested could be brought into a suitable condition for the future meetings of the Commissioners, this being considered a cheaper option than erecting a new building. By December 1787, the Commissioners were meeting in this newly converted building and it was already being referred to as the 'New Town Hall'. The Margate lock-up was built as part of the conversion of the old building in the Market Place into the New Town Hall. Permission had been granted in 1777 to hold a market on pier Green, together with a ‘Court of Pie Powder'. 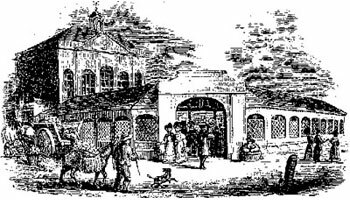 This market was housed in a properly constructed building which, by 1819, was in a very dilapidated state. A new Town Hall was erected in 1820, funded by public subscription, and various additions and alterations were made over the ensuing years to the Town hall and Market. The Town hall continued to house the Constabulary and lock-up and a new Police Station was built under the Town Hall in 1897 when the new Municipal Offices were built. The Town Hall continued to serve as a police station, Magistrate Court and Town Hall until 1959 when a new police station was built on Fort Hill. Plans of the two buildings dated 1946, show the Mayor’s Parlour in the Municipal building, occupying what later became the Civic Office, and the Chief Inspector housed in the later Mayor’s Parlour. The Committee Room retains its position with the other rooms on the first floor being the domain of the Chief clerks and assistants. Meanwhile, the ground floor housed the CID, Detective Sergeants, Town Sergeant and somehow managed to squeeze in two garages and a cycle shed apart from the strong room. Margate Museum now occupies the original Town Hall. How Did Margate Gain its Charter and 'Freedom' From Governance? On 29th Jul 1857, Margate gained its Charter and 'freedom' from governance by Dover. The first election to the new Town Council was set as Monday 2nd November 1857, there being just four wards – Cecil, Marine, Fort and Pier. The first meeting of the Town Council took place on 9th November 1857 and the first task was to elect the Aldermen and Mayor. The first Mayor to be elected was G.Y. Hunter (Cecil Ward). Although Dr Price had been nominated and seconded and voted in unanimously, he declined on personal grounds. The Town Council continued to meet in the Town Hall but with the growth of Margate and the associated administrative roles and duties, a new building was required. The present Municipal Building was erected on the site of the Old Market Place building. The cost of the new building, was totally defrayed through the generosity of Mrs Martha Hannah Kendal, widow of Alderman Daniel Kendal, who had been a corn merchant with premises in Market Place. Thus the cost, £3000.00 (at today’s value £330,000), did not, thanks to the beneficence of Mrs Kendall, fall on either the Town Council or Rate Payers of Margate. Since late 2013, the Mayor and Civic Office has been housed in the Media Centre in Margate, whilst the Town Hall awaits major repair and renovation.